A short walk was just the thing. I had been inside all afternoon, and needed a break. It was too late in the day, and way too hot to do anything serious. In addition, Terri and I had agreed to take it easy, as we both managed to catch a cold. On a long-term trip it’s inevitable, but usually, our sickness is staggered so one can take care of the other. We are saving our energy for an elephant safari tomorrow afternoon, thus a short stroll seemed a good idea. 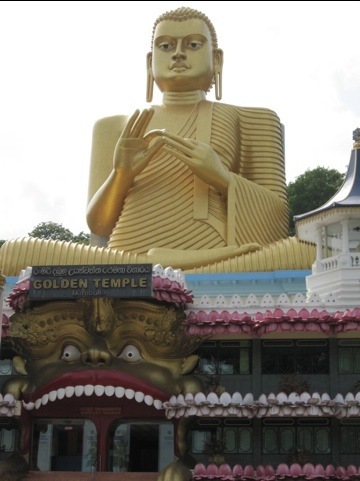 I enjoy these walks because in countries like Sri Lanka, that have such a different culture and lifestyle, you never know what you’ll run into. 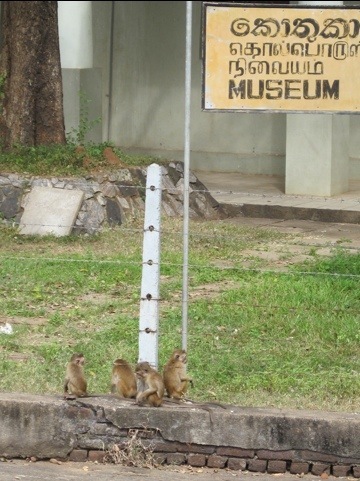 For instance, I ran into a small group of honor’s class monkeys queued for the museum. Actually, they were part of a troop of 15-20 monkeys wandering around the Golden Temple and Buddhist Museum. Someone had left a small pile of food, and I watched as groups of 1-2 came and took their turn eating. Each took a bit, and then moved away. This mother also took her turn, and the rotation continued. No one took more than their share, and everything seemed automatic. 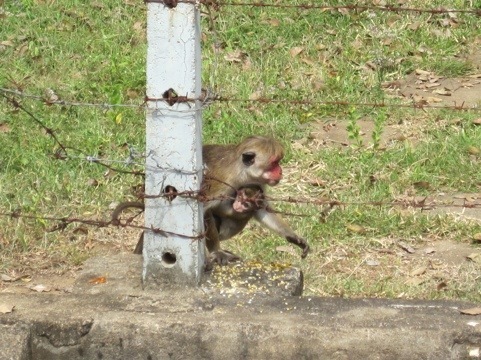 Monkey troops are known for complex social behaviors, and this was an interesting example. I saw these monkeys because I had wandered into an open field beside the Golden Temple. I was looking for a simple, natural photo, and this angle seemed to work. 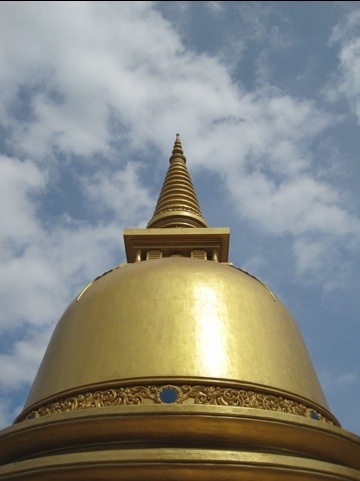 However, when it comes to decorating temples, Buddhists aren’t shy. 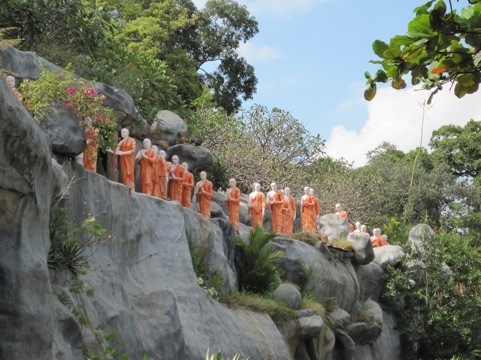 If these monks look a little pasty, it’s because they’re cement, but it’s a good effect nonetheless. However, these guys are the real thing. 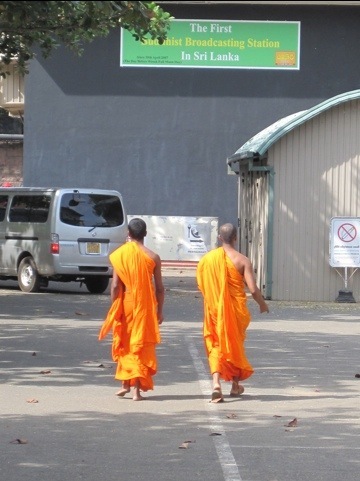 And from the sign above their head, I suspect they’re a couple of DJ’s on the way to work at the Buddhist radio station. Didn’t I say you never know what you’ll run into on these walks. 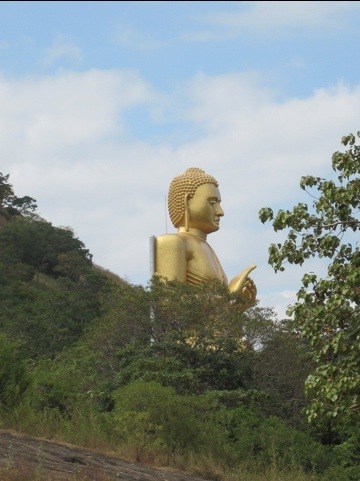 Tags: Buddhism, Dambulla, Monkey, travel. Bookmark the permalink.